Among the estimated two million agricultural workers in the United States, physicians diagnose 10,000 to 20,000 pesticide poisonings each year.1 The National Institute for Occupational Safety and Health (NIOSH) established the Sentinel Event Notification System for Occupational Risks – Pesticides Program (SENSOR-Pesticides) in 1987 to reduce the number of injuries and illnesses associated with occupational pesticide exposure. The Program is a U.S. state-based surveillance effort that monitors pesticide-related illness and injury in 11 states.2 Under this Program, NIOSH provides technical support and funding to state health departments to build and maintain surveillance capacity and to bolster pesticide-related illness and injury surveillance. The U.S. Environmental Protection Agency (EPA) also provides funding support for the Program. In 2005, three migrant farmworkers living in the same region of Florida gave birth to infants with birth defects within eight weeks of each other.4 Though suspected, the possibility of workplace pesticide exposure during the maximum sensitivity period of their pregnancies was not initially confirmed because one of the three women had not been working in Florida during this period. 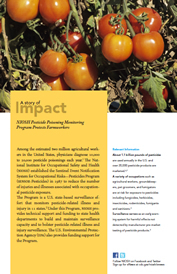 The SENSOR-Pesticides Program facilitated collaboration between states that revealed that the three mothers worked for the same tomato grower during their maximum sensitivity periods – two at the grower’s Florida operations and one in North Carolina.4 Thorough investigation was not able to establish a causal link between the mothers’ possible workplace pesticide exposure and their infants’ birth defects. However, the Florida Department of Agriculture and Consumer Services and the North Carolina Department of Agriculture and Consumer Services inspected the tomato grower’s farms and found several pesticide and record keeping violations. Later, North Carolina created a taskforce whose findings motivated the state legislature to pass anti-retaliation and recordkeeping laws, training mandates to protect the health of agricultural workers, and funding for improved surveillance.5 The Florida state legislature provided funding to add ten new pesticide inspectors. To receive NIOSH documents or more information about occupational safety and health topics, please contact NIOSH. 1 US EPA . Regulatory impact analysis of worker protection standard for agricultural pesticides. Washington, D.C.: U.S. Environmental Protection Agency. 2 Calvert GM, Plate DK, Das R, Rosales R, Shafey O, Thomsen C, Male D, Beckman J, Arvizu E, Lackovic M . Acute occupational pesticide-related illness in the US, 1998-1999: surveillance findings from the SENSOR-pesticides program. Am J Ind Med 45(1):14-23. 3 CDC (Centers for Disease Control and Prevention) . Illnesses and injuries related to total release foggers — eight states, 2001-2006. MMWR 57(41):1125-1129. 4 Calvert GM, Alarcon WA, Chelminski A, Crowley MS, Barrett R, Correa A, Higgins S, Leon HL, Correia J, Becker A, Allen RH, Evans E . Case report: Three farmworkers who gave birth to infants with birth defects closely grouped in time and place ─ Florida and North Carolina, 2004-2005. Environ Health Perspect 115(5):787-791. 5 Calvert GM, Higgins SA . Using surveillance data to promote occupational health and safety policies and practice at the state level: a case study. Am J Ind Med 53(2):188-193. 6 Grube A, Donaldson D, Kiely T, Wu L . Pesticides industry sales and usage. 2006 and 2007 market estimates. Washington, DC: U.S. Environmental Protection Agency, EPA Report No. EPA-733-R-11-001. 7 7. National Pesticide Information Retrieval System . Federal pesticide product [http://ppis.ceris.purdue.edu/htm/product.htmExternal]. Date accessed: October 2011.